Been recovering from an accident and surgery and watching a lot of TV, I was pleased to see a commercial for one of Kentucky’s best wineries. For the last year, I’ve been recommending Brianza Gardens and Winery to anyone who asks me about Kentucky wines, especially those living in Northern Kentucky. They are just off the Walton exit on I-75. Their new commercial did a great job of giving wine lovers a reason to visit. Once you try their wine, you’ll keep returning. With warm weather returning, it’s a great time to visit a winery. You will be glad you did. Check their website for hours. When the weather is bad and it just looks dreary when you look outside, a good way to cheer yourself up is to treat yourself with a special bottle of wine and an inviting fire in the fireplace. We had three of those nights in the last month, with three amazing red wines and they were all from Kentucky. In case you doubted it, take my word for it, Kentucky makes some great wine. One of our favorite wines in the state has been Reserve Norton from Chrisman Mill Vineyard and Winery. Reserves are created with the best grapes from the year. We have enjoyed each vintage of this wine since 2005, when winemaker Chris Nelson began making it. We had been saving a few bottles from that first vintage and opened one. If you’ve ever wondered what happens when you age a red wine, a good wine gets even better. The aromas and flavors become more intense while at the same time becoming smoother. The wine was worth the wait. For Valentine’s Day, we enjoyed a bottle of Jim Wight’s special blend of three reds. In 2013, Wight-Meyer Vineyard and Winery released a wine called 3 Reds by Wight, a Meritage style, made of a blend of Cabernet Sauvignon, Cabernet Franc, and Petite Syrah. 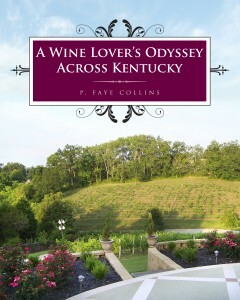 This wine is fantastic and proves again that Kentucky can produce an excellent wine with grapes raised in Kentucky. Jim Wight did it. Each time we open a bottle, it seems better than the one before. Our third exceptional red was Grand Reserve Cabernet Franc, from Lovers Leap Vineyard and Winery. This 2009 vintage was released in 2013. It has improved with age; and it started out great. The flavors have mellowed and smoothed over time. From the aroma of dark berries, to the lingering flavor of a chocolate covered cherry, the experience is fantastic. The good news for wine lovers is that this is only the beginning. This is not the only great red wines. We’ve enjoyed many of Kentucky’s reds and look forward to many more.